Do you remember this appliqué sampler that I made? Well I’ve been pondering for a while how to quilt it. 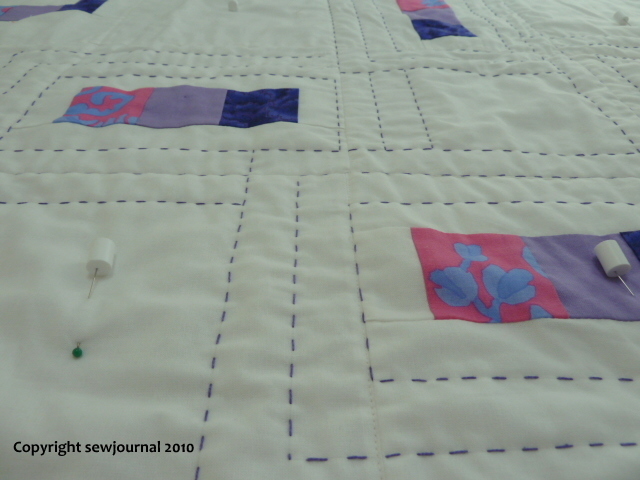 I didn’t want to spend too much time hand quilting it and I’m not a confident or skilful free motion quilter either. Anyway one of friends was quite taken by the large stitch, Perle 8 quilting that I did on some of my quilts like the Which Way? Quilt and is now quilting anything that isn’t nailed down using it. That’s when I thought that Perle 8 “free motion” hand quilting in white or pastel colours would be great on this sampler quilt. What do you think? I don’t think you can go wrong with that quilting, it looks great to me. The pictures you posted make me wish I could get into quilting as well! I like the applique quilt idea a lot. Mmm, I reckon that idea’s got potential, Munaiba. I wonder how it would go with just a row or two of stitching at the block borders, just to frame the designs. It’s such a pretty little piece and you’ve such a good eye that if anyone can make it work you can.